ievo has been designed after many years of research from a team of professionals who have been at the sharp end of biometric deployment, installation and integration. This wealth of knowledge has been obtained from not only our own experiences with the shortfalls of existing technologies, but also obtaining feedback from installers and end users. Biometrics has proven time and time again to overcome all of the security issues that card and fob systems have, however, the cost of biometric systems coupled with the reliability issues have curtailed profits and industry growth. The newest offering, ievo ultimate has been designed to seamlessly integrate into existing card and fob systems by utilising the original manufacturers controllers through the use of wiegand inputs. ievo offers installers the opportunity to offer a reliable and superior biometric product to all of its new and existing clients. ievo has combined many unique features offering a large number of outcomes and benefits. ievo ultimate TM uses multi spectral imaging combined with a superior award winning algorithm offering a system that will work in very harsh environments even with problem fingerprints. Easy to install "plug and play system"
ievoTM researched with end users, installers and architects and found the consensus to be that a reader should be small in size to fit in with the environment it is to be placed. An access control product that is placed next to a door is always a concern. Couple this with the DDA requirements and a larger unit can be obstructive and has limited applications. ievoTM is quick, clean and an efficient access control reader which increases footfall, a must for all access control systems. The ievo ultimate TM has no screen which is the easiest part of any reader to vandalise, it has no keypad which is also another area of concern. The ievoTM case is manufactured in a polycarb ABS mix offering both flexibility and rigidity. Couple this with a toughened glass sensor and piezo button the ievoTM reader will withstand a large range of attacks. ievo is IP rated to industry standard 65, offering a reader that can be mounted internally or externally without compromising its efficiency or reliability. The ievo ultimate TM can be flush or surface mounted offering the desired requirements for the aesthetics of its enviroment. 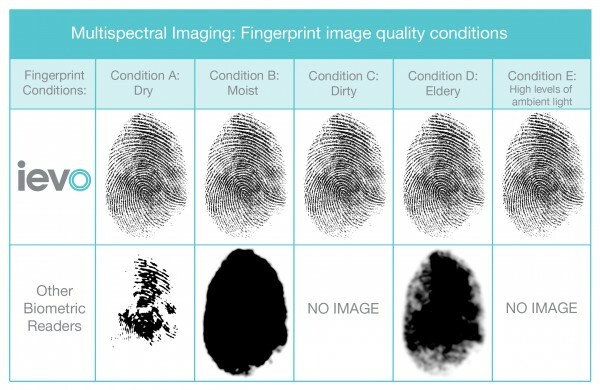 The ievo sensor technology will obtain the finger print image through water, dust, dirt, oils, creams and even some latex gloves. An IP rated case enables ievo to be used in the harshest of environments. The ievo ultimate comes in four choices for specification. An internal flush or surface mounted, or an external flush or surface mounted with a built in heater system which enables the reader to operate at -20°C. The ievo external reader does not have to be mounted in a case or box like other leading biometric manufacturers. ievo Ultimate TM has been designed to seamlessly integrate into existing card and fob systems by utilising the original manufacturers controllers through the use of wiegand inputs and outputs. ievoTM offers installers the opportunity to offer a reliable and superior biometric product to all of its new and existing clients. Most competitor biometric access control products have built in controller/relays. These can be easily removed from the wall and gain entrance by shorting the relay. This is not how a security product should work. ievo ultimate TM contains no controllers or relays. ievoTM 's matching board is housed internally, up to 5 meters away. By simply providing ievo TM a colour RAL number we can supply you with the required number of readers to exactly match your colour. This has proven to be essential when specifying into new builds with corporate colour requirements. 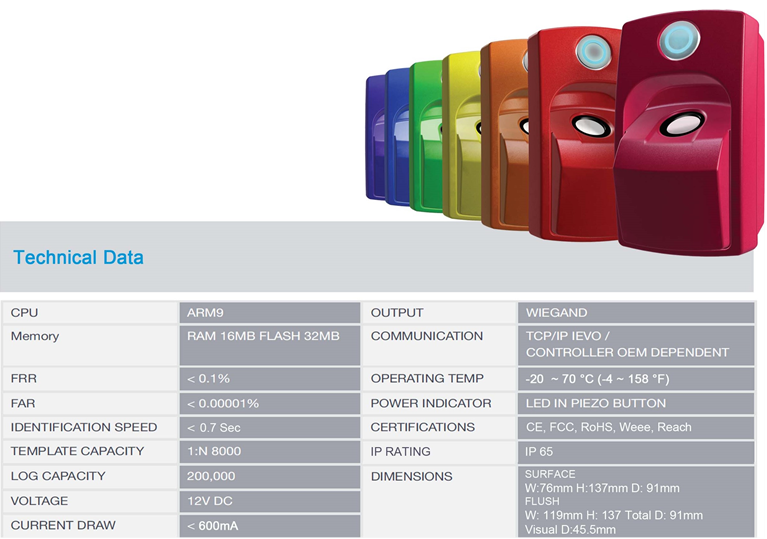 We will also hold a total order percentage as backup stock of your colour reader for a future add on to your system. A well communicated issue with existing biometric products and its software is due to the duplication of registration information when integrating the reader into existing systems. ievo TM eradicates these issues and its software is not only effortless but is very quick and easy to use and compliments any existing software.